Santa Clara County is a heavily-populated county at the south end of San Francisco Bay. The city of San Jose is centered in the Santa Clara Valley, now an urban and light industrial area that once was famed for its orchards and before that was the wheat-growing center of the new state of California. There are famed wildlife reserves at Palo Alto and Alviso, and an important banding station along Coyote Creek (San Francisco Bay Bird Observatory). 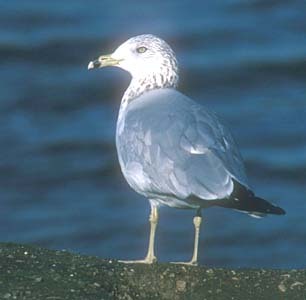 San Francisco Bay NWR holds important breeding colonies of egrets, terns, and gulls. Despite the urbanization, there is much wilder country to the east and south, in state parks and open spaces in both the Diablo Range (where Mt. Hamilton dominates) and in the Santa Cruz Mountains to the west. County birding statistics and links are on Joe Morlan's site. Field work for a breeding bird atlas has been completed, but the project has not yet been published. 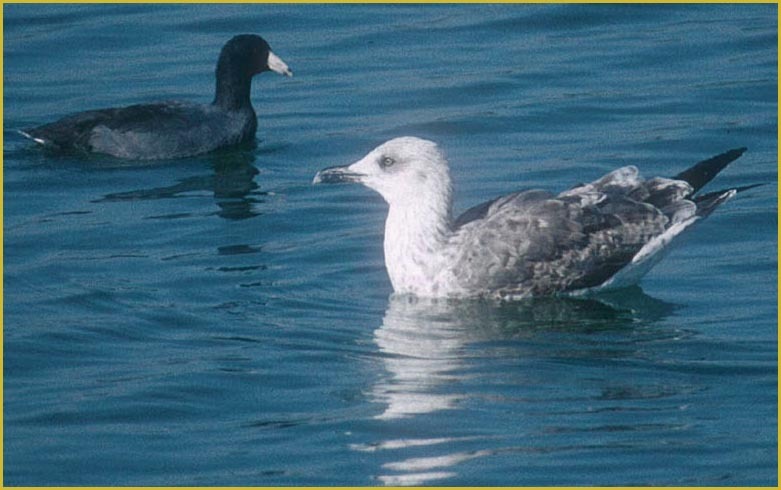 For Santa Clara County the prime photo is of a returning vagrant that we chased: a Lesser Black-backed Gull at Lake Cunningham in San Jose. It is in its second cycle and has already acquired a pale eye [it returned for additional winters]. Of the various shots I took, I liked this one with an American Coot crossing behind, going in the opposite direction. 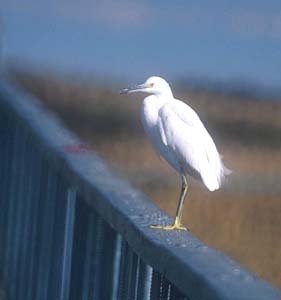 Although I have photographed other vagrants in SCL (e.g., Glossy Ibis, Williamson's Sapsucker), I've chosen two common birds from the Palo Alto Baylands to round out the county page: Snowy Egret (sitting on the boardwalk railing at high tide, 1 Dec 1986) and an adult Ring-billed Gull (16 Jan 1979). A favorite birding spot is the Palo Alto Baylands refuges with its trails and boardwalks out into the marsh. They are particularly popular during the highest winter tides of the year, when rails (especially Clapper Rail and Black Rail), and rare winterers like Nelson's Sharp-tailed Sparrow, are forced into view by rising waters. It is a stressful time for the rails, especially when egrets and gulls start picking them off. The view below shows such a high tide on 1 Dec 1986.